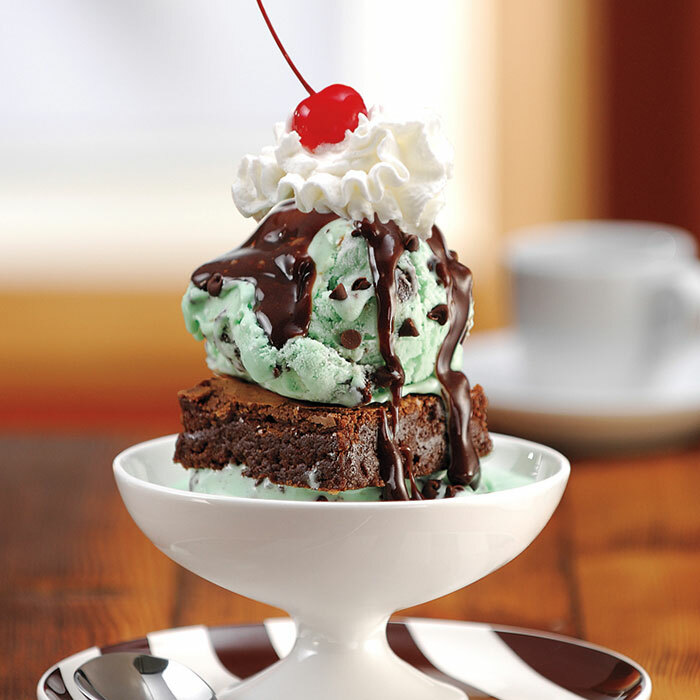 Indulge your sweet tooth with this chocolatey, minty, decadent delight! Preheat oven to 350°. Spray bottom of 9×9-inch baking pan with nonstick cooking spray. In small microwave-safe bowl, heat chocolate chips and butter in microwave oven on high 1 minute or until mixture is smooth, stirring every 30 seconds. Let stand at room temperature 10 minutes to cool. In large bowl, whisk together eggs, sugar, vanilla extract and salt for 1 minute. Stir in cooled chocolate mixture, then fold in flour. Spread batter evenly into prepared pan. Bake 20 to 25 minutes or until toothpick inserted in center comes out clean. Cool brownie in pan on wire rack. Cut brownie into 9 squares. To serve, heat fudge topping as label directs. Add 1 scoop ice cream into each of 9 dessert bowls, flattening ice cream slightly. Place 1 brownie over ice cream, then top with a second scoop of ice cream. Pour fudge topping over ice cream and garnish with whipped cream and a cherry, if desired.